Just a quick share with you all my card for Your Next Stamp's Friday Fun Project. This card also showcases the current sketch and color challenge you can will find on the YNS Blog. Come play along and you can win some fun prizes! Thanks again for stopping by and be sure to come play along with us! Have a great Friday! Today is a fun day full of inspiration on the Your Next Stamp blog! It's Feature Day and it's all about Love. Valentines is just around the corner, so your mojo will be flowing when you see all the fun and fabulous project the DT has come up with. I hope you enjoyed this little fun project. Be sure to head over to the YNS blog for more inspiration and wonderful designs! Have a great day! This card is a shaker card, which seem to be all the rage right now. Good thing too because I realized the last shaker card I made was literally a year ago! I love the look of all white with a pop of color and thought a great way to do that is definitely with some sequins being that "pop" of color. I started off with some heavy weight cardstock for the base and layer. The window cut out is a PTI die while the stitching on the side is a die from Your Next Stamp. The sentiment is from a set from Flourishes (no longer in business) called Roses for love. The sequins are some I had from Fancy Pants, but Pretty Pink Posh has some fantastic blends that I am going to have to purchase. Yay for crafty shopping! Thanks for stopping by and hope you have a great night! As most of you know, Paper Crafts Magazine decided last month to close its doors and make this months issue the last. And if you are like the rest of us, we are quite bummed to see them go in an industry that is forever changing. I don't know about you, but I really thought PC would be the last man standing! :) Years ago, I tried to get published in this magazine and never made it through. I was frustrated and didn't do it again for a while. I decided to go for it again for this particular call and you can only imagine my excitement when a yes came through! It was short lived, but just knowing they liked what they saw is humbling enough. So- I thought I would share with you two cards that were recently selected for publication before the announcement was made. Thank you to PC Magazine for considering my two cards, I am flattered! Isn't it fun? I really enjoyed making this card and was thrilled that it was picked up by PC Magazine. My second card was using some dry embossing. I got a little creative with this embossing folder to give it the layered look of various colors. This card was a CAS look as well using Avery Elle's set of Handwritten Notes. Love this set! I started by embossing the white panel a little more than halfway up and then taking a few scraps I had in a nice color palette and embossed those. I then fussy cut each row to have it fit on top of the white embossed row. The sentiment was stamped directly onto the card and the look was completed by a row of rhinestones, a button, and some twine. There it is! My two almost published cards... I hope you enjoyed them and thanks for popping in. Have a great Tuesday! 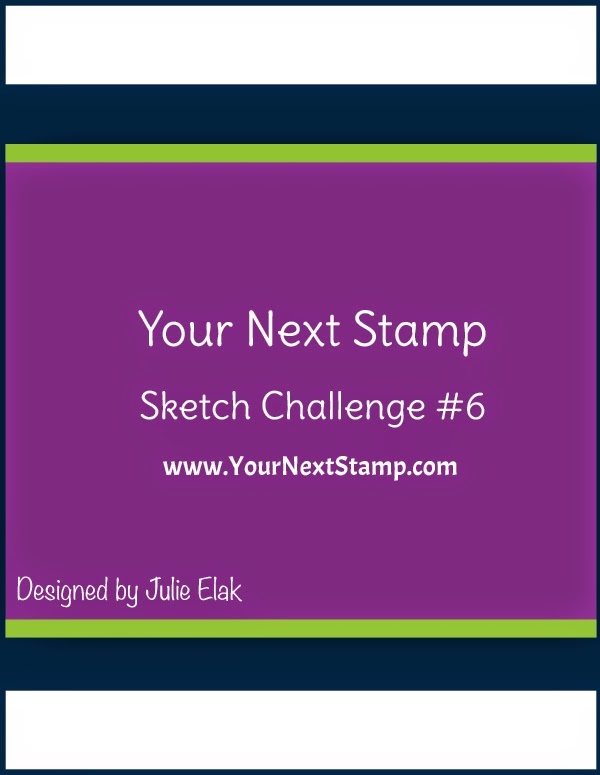 Have you checked out the fun sketch over at Friday Sketch Challenge? The sponsor is Fitztown and they have beautiful images perfect for this sketch. My card is made using Cameo and I just love it. So feminine and beautiful. I had a wonderful time coloring her with my Copics. The patterned paper is from Basic Grey's Sultry collection and the image is popped up. I really wanted the focus to be the image so I left off a sentiment for later and finished off the card with some paper roses, rhinestones and pearls. Thanks so much for stopping by and be sure to check out the other fabulous projects from the DT! Just a quick pop in to share with you my Friday Fun Project with Your Next Stamp. This card was made using the new release of Fun Charts. A great Valentines set where you can get really creative in making a unique project. I used the main chart as the main image accenting it with an arrow I took from the set Moving Ellie. I layered it on top of some patterned paper from EP Head over Heels, accenting it with some fun borders from YNS Awesome Borders 2. The side stitched lines were made using the YNS stitched line die and I completed the look with some YNS gumdrops and some ribbon. If you haven't checked out the newest release, you must!! It is a fantastic and fun release that is sure to please. Thanks for popping in today and be sure to check out the other fabulous creations from the DT on the YNS Blog. Have a great Friday! This sweet image is called Baby Dragon Queen. It's a digi image that I manipulated just a bit. I added some folds into the dress and some spots to the dragon. Once colored, I topped off her dress with some Wink of Stella for that sparkle every queens dress should have! The sentiment is from Tiddly Inks freebie set of Froggie Thoughts. It has some great fairytale style sentiments that went well with this image. If you know me, you know I like CAS cards. Layering has never been my forte, but I do do it. However, I really wanted to showcase this image against some simplicity of the patterned paper, black, and white. The patterned paper is from EP Little Girl mini collection. I completed the card by popping up the main image and sentiment and finishing it off with some sequins and a small open fabric heart. Well, here's to fingers crossed and happy endings to all who entered. Thanks for stopping by and hope you all have a warm, sunny Tuesday! It's time for a dare... That's right! It's the YNS DT Dare. This is a fun monthly challenge for the DT to showcase another project using the guidelines given. And YOU can even win a prize just by commenting. Isn't this the best set?! I do love the creativity of it and there are other sentiments and images that can be used. The image was colored with Copics and cut out using the coordinating die set. Everything is popped up and finished with some fun YNS gumdrops. The sketch used is from Sweet Sunday Sketch. Don't forget to stop by the YNS blog to comment so you have a chance to win! Thanks for stopping by and have a great Saturday! Happy Friday everyone! What a week for us here in VA.. The first week back and we have been on delays and no school for most of the week due to the weather that decided to roll in. Of course to be expected this time of year, but after 2 weeks off for the holiday, we were ready for the usual schedule. Being Friday, I have a cute image and sketch to share with you for the Friday Sketch Challenge. Come check it out and play along. You can win just by linking up. This image is from All Dressed Up and called Love in the air. Isn't it adorable? The image was printed on Neenah cardstock and colored in with Copics. I boxed out the top of the balloon so it would stand out from the main panel. The patterned paper is from K&CO. My Copic airbrush system was used to make the "sky" background and popped up over the other panels. Using my YNS cloud dies, I added those to the balloon for a more realistic look to the sky. I completed the look with some rhinestones and mini hear stickers I had in my stash. Thanks for stopping in today and be sure to check out the other fun and fabulous projects from the DT! Have a great Friday! Guess what day it is? Guess. what. day. it. is?! It's new release day!!! (I bet you thought I'd say hump day, didn't you?) :) Well, it is, but more importantly, it's Your Next Stamp's January release. I always love seeing what each month has in store for YNS and this month is fantastic! 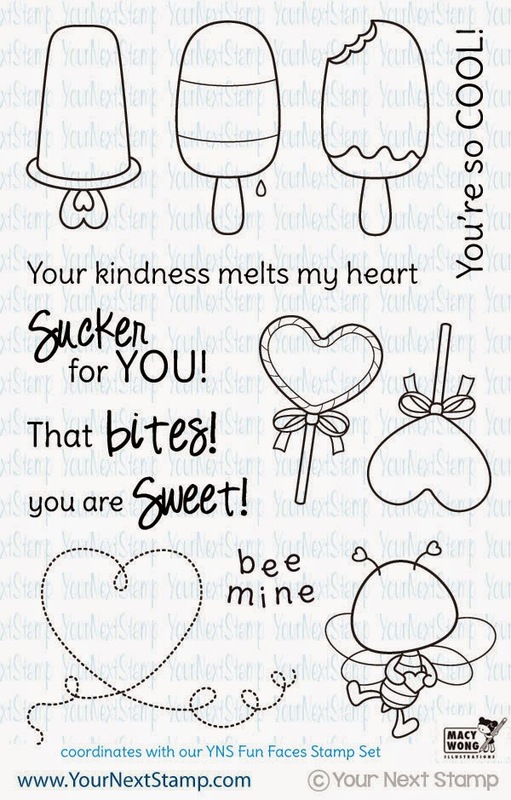 Many great sets to help with your Valentines projects as well as your everyday thoughts put into a project. For this card, I used the new release set of Fun Charts to make this fun Valentines day card. For the layout, I used YNS current sketch over on the challenge blog. It made for a perfect set up! I used patterned paper from EP's Head over Heels collection and by using one of the patterns, I paper pieced it to the thermometer. The sentiments were individually stamped in the chosen colors to avoid a box around it, while the arrow was hand drawn and cut out. It was then popped up and finished by adding some fun gumdrops from YNS. I made a second card using Sweet and Cool. This is a super fun set and one I thought would be good for a CAS layout. 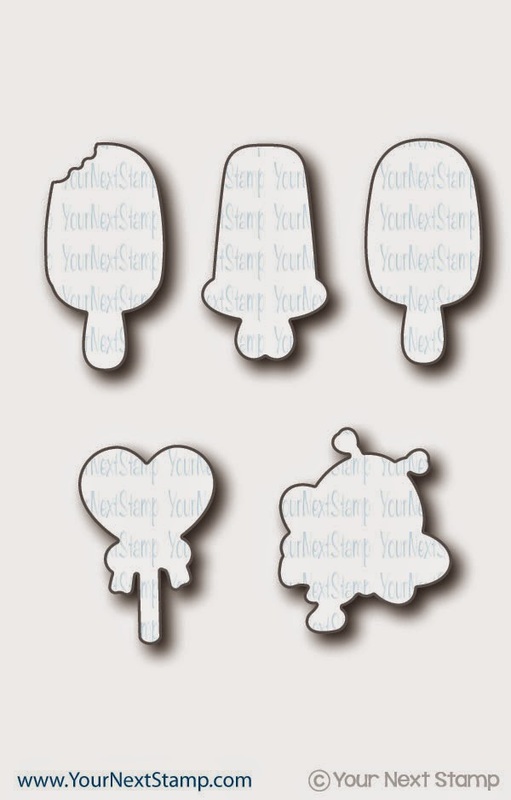 If you did not see my lollipop Valentine I made with this set, you can see it here. Another great versatile set. I used the coordinating die to cut out the popsicle and color it in with Copics. The patterned paper is from MME and the fun diamond border used is YNS Awesome Borders Two. I completed the look with some glittered pink gumdrops. 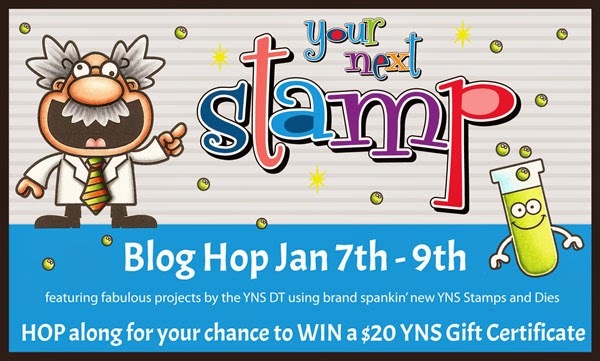 Don't forget to continue hopping for your chance to win $20 to YNS just by commenting!! Not to mention, there is a fantastic special just for checking out this new release. You can save 20% on your order!! Hello!! Happy New Year to you all and I hope you had a great holiday. Today we are kicking off the New Year for Party Time Tuesdays with many new DT members and a fantastic sponsor for the challenge. Our challenge is Anything Goes and our sponsor is Spectrum Noir! How cool is that?! I created a simple birthday card that was for my mom using some dry embossing with a hint of patterned paper. I used a stamp from SU! on an oval from SU! too. The large oval punch was used and after stamping the sentiment, it was popped up over the strip of patterned paper which lied over the embossed panel. It was completed with some small paper rosed, some pleated ribbon, and some rhinestones. We hope you come play along with us and link up your project for your chance to win. Thanks for stopping by and be sure to check out the other DT member's projects. I hope you all had a great holiday and had some time to relax. I certainly took advantage of the break and used every little bit of it to spend with the family. Now... it's back to creating! 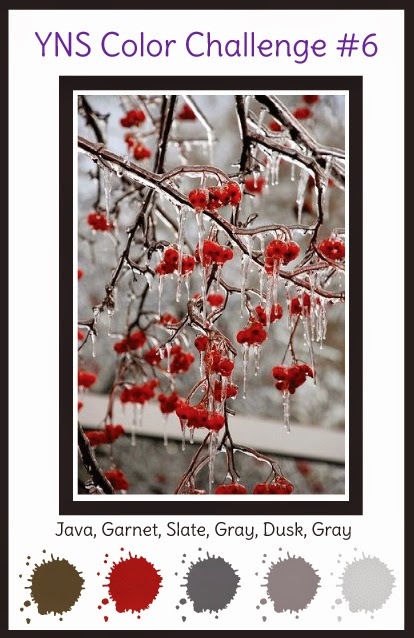 Today begins the sneak peek's of Your Next Stamp's January release!! Yippee!! This release is so much fun and makes for some super cute, super fun Valentine cards or projects. Be sure to stop by the YNS blog for the full sneak peeks and fabulous projects! Not to mention we have 2 new DT members. You will want to be sure to check out their projects and blogs! Thanks for stopping in and have a great Tuesday!